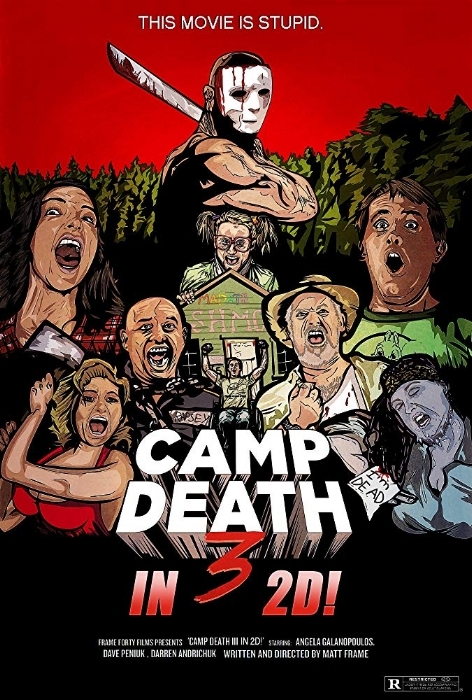 Camp Death III - In 2D! In 1979, the horrendous killing spree by Johann Van Damme at Camp Crystal Meph finally comes to an end when Final Girl Alice Wainright finally turns the tables on him and takes him down. Three years later, the camp's owner is convinced by his nephew to reopen the camp as a nature-set rehabilitation centre for the criminally insane. However its not long before people start dying in horrific ways by an unknown person - has Johann Van Damme returned to continue his reign of terror? Camp Death III - In 2D! Is going to split audiences between those who love its pastiche of Slasher movies (and other cult 80's genres) and those who will be turned off by the low budget fx and shrill, manic nature. Having watched the film a couple of times now, I find myself…sitting on the fence. This could easily be written off as a dumb low budget movie, and many will see it that way. However underneath the shrill silliness are some sly moments of humour and filmatism at work. I laughed out loud at the audacity of making the camp a holiday destination for Jews, for example, and some of the slapstick and physical comedy works really well. There are some action moments which are well shot and edited that they transcend their limited/no budget fx- such as Uncle Mel fighting the killer with the van. There is a lot of technical skill going on behind the camera. The toaster scene was pretty accomplished, and the photography on the swimming pool scene was really crisp and actually lovely to look at. The prologue was pretty clever too - a reworking of Friday 13th (or Part 2?) - in that, the final girl poses as jason's mother to get the upper hand. At Camp Meph, Alice uses a muppet version of Van Damme's mother. Where the film lets itself down is in its tone, which has ZANY MANIC SHRILLNESS turned way up to 11. Hardly any dialogue is spoken in a normal tone of voice, everyone is shouting and screeching at all times. The only character this works for is foul-mouthed Uncle Mel (Darren Andrichuk). 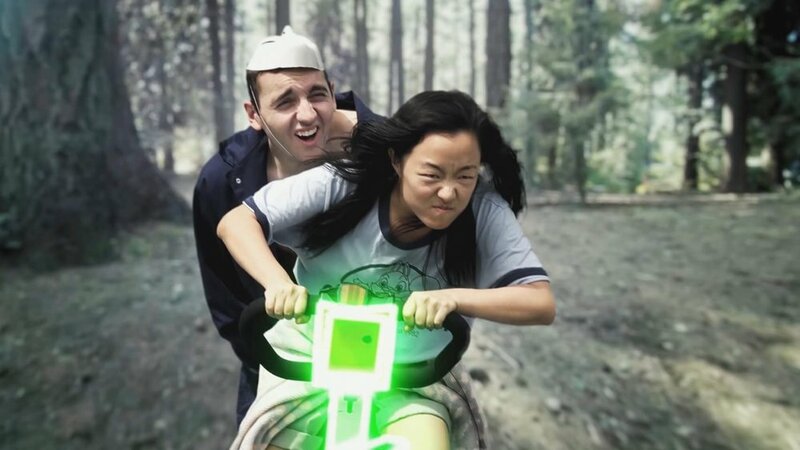 The zaniness of the film, where no joke is too silly or out of place, also hurts the pastiche - when characters are suddenly zooming through the forest on Star Wars-like speed bikes, it takes you out of the whole slasher movie vibe. The foul-mouthed puppet of Van Damme's mother kind of works but is pushing the envelope, and the whole Caddyshack-ish squirrel scenes, although ultimately kind of funny, end up being sub-Loony Toon diversions. Director Matt Frame is very self-deprecating when it comes to his film (even the poster has no qualms about the kind of film its promoting), possibly in an effort to render any negative reviews of the film redundant. Yes, it is a very silly film. But there are flashes here and there which speak of a very technically adept film crew and post-production team, and a script which sometimes strikes the right notes.